I recently took a few long road trips with my two-under-two boys and have learned a few things. I’m mainly writing this post for myself to revisit before planning another road trip as the sole independent human in the car. 1) Try to NOT take any solo road trips with your two-under-two children. Single parent – your “every day” is my “occasional.” You’re my hero. 2) Lots of snacks. Keep in mind that most snacks will end up all over your toddler and his car seat. But also keep in mind that you don’t mind cleaning up a mess later if it buys you 30 more minutes of peace. 4) Turn your passenger’s seat into Mary Poppins’s purse. 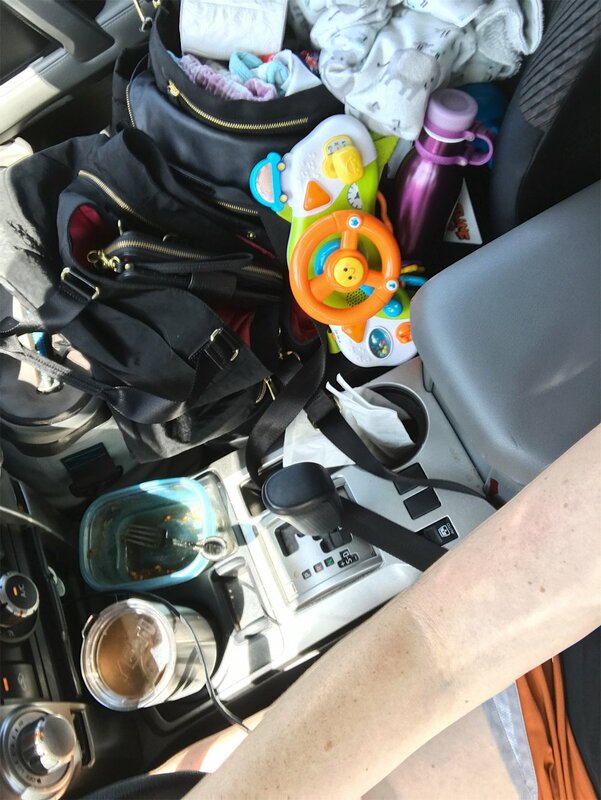 Food, blankey, toys, books, sippie cup… We start out road trips with nothing but the Toddler’s brain to entertain him. Then, on a strictly as-needed basis, bring out one new form of entertainment at a time. Pro tip: I have 2 toys and a book that I keep stored away and ONLY bring out on road trips. This gives the “new toy” effect, without having to spend money. You’re welcome. 5) Pack toilet paper. You will NOT make it to the bathroom. Queue the PG-13 rating here. Any male readers still with me? Turn back before it’s too late!!! You whip into a gas station after having held the baby off from eating as long as you could possibly stand because if you could make it just 30 more minutes, then you might be able to make it to your final destination without stopping to nurse again. Selfish. Anyway, it’s time to feed the sucker. Yeah, who has time for that? And who can hold their pee that long? Option 1 - Quickly buckle the toddler and newborn back into their respective seats, leave the car on and run to the bathroom. Risks: someone steals your car and/or babies, someone calls CPS, you lock yourself out of the car, you pee your pants anyway because you can’t run without wetting your pants. Option 2 - Bring the kids with you into the gas station as you carry your infant and try to convince your toddler to toddle a little faster PLEASE. Given: you WILL pee your pants, so what’s the point? 6) Wear Nike shorts on all road trips. Put a pad in the Nike shorts as a safety precaution. Bring a red solo cup with you. No, not for drankin,’ ya sicko! For peeing. Actually, any empty container will work. No lie, this last trip I poured out a can of mixed nuts and used that bad boy to relieve my bladder (don't worry, I saved the nuts). All you have to do is move your driver’s seat back as far as it will go, scoot up to the edge of your seat, pull your Nike shorts over to the side and empty your bladder into the red solo cup, empty Starbucks mug, or empty peanut can. The best part? You look like you're just sitting in your car like a normal person AND you still have a free hand to wave at passerbyers. Real footage from our last road trip.